So much for trying to do two posts a month. Didn’t come close. But I have a good excuse. My little boy arrived early on November 3! We are very blessed this year and have so much to be thankful for this holiday. 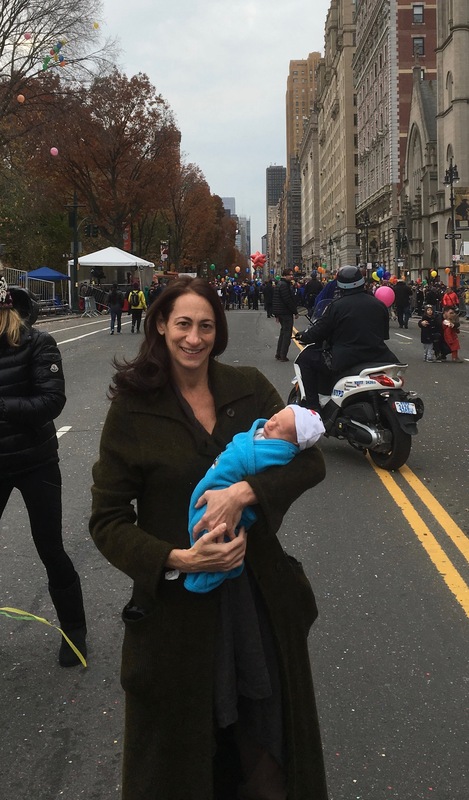 We were a little late to the Macy’s Thanksgiving Day Parade, but you can still see balloons in the background. Of course, I won’t be having much time to fill you in on the Cayman Islands, Africa or any new recipes at least until the New Year when he starts sleeping for more extended periods. In the meantime, we’ve tried to maintain some normalcy. We still cook dinner most nights. Yes, really! Teamwork is the key. Whoever is least tired, does the cooking. My wonderful husband has really pitched in and expanded his kitchen skills – even making braised lamb shanks and salmon in addition to his expertly cooked steaks and ribs. We even managed to make a full Thanksgiving dinner for just the 3 (well 2) of us! I kept it simple with pumpkin bread, curried pumpkin soup, a wet brined turkey, my twist on artichoke, parm and sausage stuffing (my fav! ), homemade spicy chipotle-orange cranberry sauce, mashed potatoes with caramelized onions and creamed kale (I think). 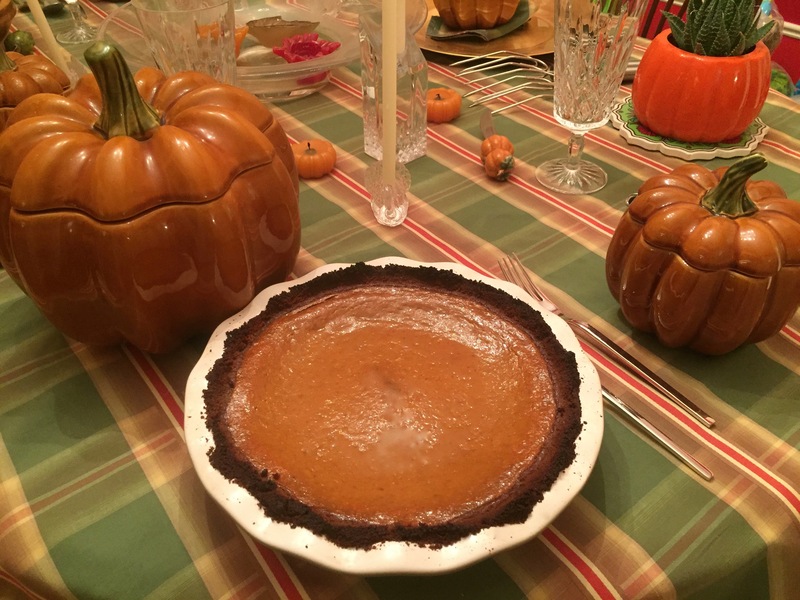 My son was very cooperative and let me get all my prep done in advance – and even baked a pie! Inspired by Trader Joe’s, my pumpkin pie has a gingersnap cookie crust, so much easier than regular dough with a 3 week old. And I’ll wait until the weekend to make an apple crumb. Casual table setting for lunch. Wedding china comes out for dinner! It’s been a roller coaster of a year. And I am very grateful for everyone who has been a part of it, helping me through some tough times and celebrating all the good – from our amazing wedding weekend to the birth of our baby boy. Make sure you take a moment today to appreciate all the wonderful people in life and even the little things that make each day special. We are lucky enough to have delicious and ample food, a festive table and house, and the ability to spend this day together as a family for the first of many times. I don’t take of any of it for granted.